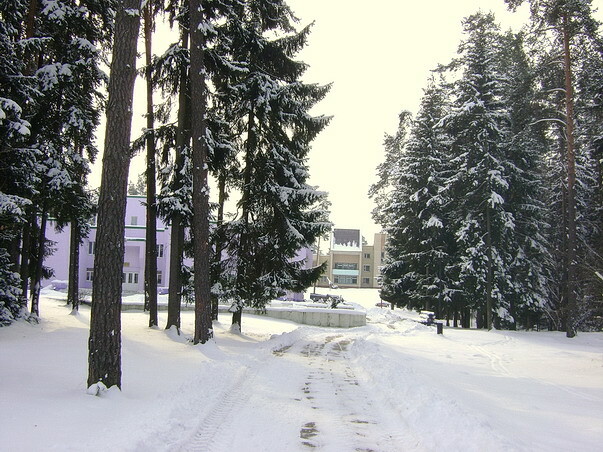 The conference will take place at the ‘Galaktika’ sport camp, in the forest on the bank of Isloch river, 40 km from Minsk. The area is covered by mobile and Wi-Fi networks. The sport camp provides to LVEE participants 2, 3, 4, and 5-person rooms (with common modern conveniences and shower cabins on each floor), a conference hall with all necessary accessories, as well as playgrounds, pool tables, pavilions and chargrills, nice pine forest. The fee includes three daily meals. If you have any special food requirements (diet, vegetarian, etc. ), make sure you let us know so we can help plan for catering. You can do that on-line after your registration request is approved. We will publish the accommodation plan shortly before the conference begins. We provide organised transportation from Minsk to the conference venue and back to Minsk on the first and the last days of the conference, accordingly. After turning right, continue for about 250 metres. Attendants planning to arrive by car are encouraged to publish their details on the wiki. Fellow-travellers are welcome!